A house on Mulberry Avenue was damaged by fire overnight with firefighters from Pomeroy, Middleport and Rutland responding to the scene. POMEROY — The Pomeroy Volunteer Fire Department, along with the Middleport and Rutland Volunteer Fire Departments, responded to a structure fire in the Village of Pomeroy early Thursday morning. According to a run report posted by the Pomeroy Fire Department, a total of 30 firefighters responded to the scene on Mulberry Avenue at around 12:50 a.m. on Thursday. There were no injuries to crews on the scene. Responding to the scene were 30 firefighters, and the following apparatus: Pomeroy Pumpers 1 and 3, Ladder 2 and Rescue 4, Middleport Engine 13 and Rescue 17, Rutland Engine 42 and Rescue 44, Meigs EMS, the Pomeroy and Middleport Police Departments, and American Electric Power. The Ohio State Fire Marshal’s Office has been called to investigate the blaze. Information from the Pomeroy Fire Department Facebook page. 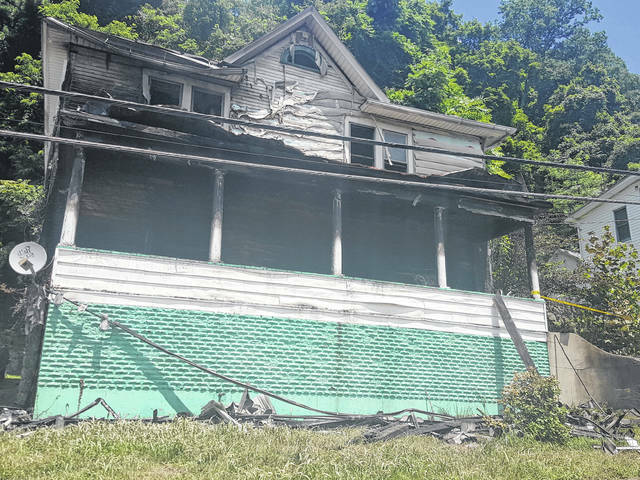 https://www.mydailysentinel.com/wp-content/uploads/sites/14/2018/06/web1_6.29-Fire_ne201862816023640.jpgA house on Mulberry Avenue was damaged by fire overnight with firefighters from Pomeroy, Middleport and Rutland responding to the scene.